Evangelist Delores Mickenswas born in Florence, South Carolina, oldest of five siblings, mother of three and grandmother of five. At the age of four Evangelist Mickens parents moved to Jersey City, New Jersey, where she completed her secular education, graduating from St. Michael High School. Evangelist Mickens was employed at the Newport Nursing Home in Jersey City, New Jersey and later she was employed at Hoboken University Hospital where she retired from in 2016. In 1997 Evangelist Mickens received Christ at a tent revival conducted by Apostle I. Ingram. Evangelist Mickens became a member of Emmanuel Temple Church. Now known as the Greater Emmanuel Temple Church, under the Pastoral ship of the Founder and Overseer, The late Overseer Elaine Bennett. Evangelist Mickens served on the usher board for 11 years, doing all that her hands could find to do. In 2008 Evangelist Mickens was consecrated as a Missionary, having a heart filled with compassion and love to see souls saved, Evangelist Mickens worked diligently on the mission field never forgetting how God had delivered her, while wanting the same for others. 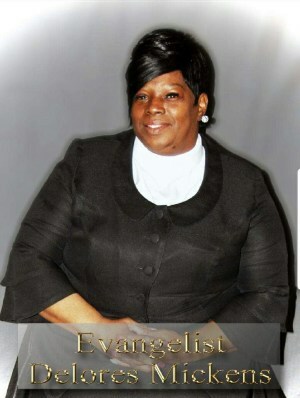 After 3 years Evangelist Mickens accepted the calling of an Evangelist, having proven her work she was ordained in 2011 as an Evangelist by Bishop James E. Graham of the Miracle Temple Churches of America, Inc. Evangelist Mickens served also as the late Overseer Bennett Armor Bearer and Nurse. Evangelist Mickens still serves on the Ministerial Board at the Greater Emmanuel Temple Church under the Leadership now of Pastor Willierine Pierce, where she stands strong on Psalm 121: 1&2 “I will lift up my eyes unto the hills from whence cometh my Help. My help cometh from the Lord, which made heaven and earth.” In 2014 she married her long time friend Dwayne Hart, where they continued to live in Jersey City. Delores loved God more than life itself and she let it be known wherever she was. Delores was a woman of encouragement and a "Prayer Warrior." She loved her children and grandchildren very much and she spoke very highly of them every chance she could. Beloved wife of Dwayne Hart, Loving mother of Sheema Mickens, Kejuan Griffin and Fantasia Mickens. Precious grandmother of Orion Mickens, Cincere Griffin, Eviona Brown, Ahmir Mickens, Adyrion Mickens. Adored godmother of Stephanie Speaks, Aaron Morgan, Amaya Speaks, Ayyub Speaks. Cherished daughter of Lillie Mae Mickens, late Thomas J. Flemming. Caring sister of Harold Mickens, Valerie Mickens(Gary), Shawn Mickens and Michael Mickens. Stepsister of Chary Wright. Godsister of Monique Hughes and a host of other loving relatives, Greater Emmanual Temple Church family and friends.